Perhaps you noticed that this blog has withered on the vine as I have been focusing all my attention on agile coaching courses and other offerings at the Agile Coaching Institute. It's a shame, really. The blog has a strong following, but I have not had time for it. It's been bugging me for a while. convened an open space session on "Women in Scrum." We considered these questions: Where are the women? How can we attract more to the agile community? How can we help the women who are here to have their voice heard? We had a lot of good ideas in that session, and something started to brew for me. Literally the next day, an agile coach colleague of mine contacted me to tell me about her success and she pointed me to her blog. Great stuff there! I thought, "People should hear what she has to say." 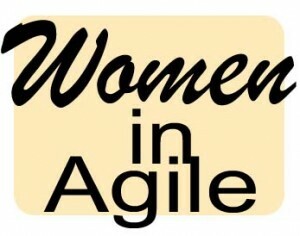 And, I realized that I have a ready-made outlet to showcase her thoughts and the thoughts of other women in agile. !). Even better, if a lot of you respond, I could actually curate multiple blog posts to form a cohesive theme, helping to expand people's ideas and vistas. About the logo...it's available for everyone to use. I imagine people will put different backgrounds on the words and play with it a bit. I like it because the text reminds me of a few things about women: we are snazzy!, we think outside the box, we are great connectors and we bridge seemingly disparate ideas and schools of thought. Yes, we do all this and more. to tell me about a woman blogger you'd like to see here.